Ten years after Sunningdale had failed, talks began between the British and Irish governments again in the early 80s. As result of the hunger strikes at Maze Prison and the election of Bobby Sands as MP, Sinn Fein was launched back into the public spotlight which threatened the political power of the SDLP.5As leader of the SDLP, John Hume persuaded the Irish government to create the New Ireland Forum to discuss the future of both parts of Ireland. The forum produced a report published in May 1984; it suggested 1) a united Ireland, 2) a confederation of Northern Ireland and the Republic and 3) joint authority over Northern Ireland.6 Unionists, the government of the United Kingdom, and Sinn Fein boycotted the forum and Ms. Thatcher strongly rejected the report with a firm "No. No. No." to the three alternatives. To the shock of many, the governments also pledged that all parties linked with paramilitaries, such as Sinn Féin, could take part in negotiation, so long as they abandoned violence. All negotiations throughout the troubles are examples of public policy changes through diplomacy, which are negotiations between governments.15 However, the Downing Street Declaration is perhaps the most inclusive example with the first mention as Sinn Féin and other non-governmental groups as negotiators. It was this breakthrough that made the declarations successful. It was considered sufficient by the Provisional Irish Republican Army, who went on to announce a ceasefire on August 31, 1994. This was then followed on October 13th, by an announcement of a ceasefire and apology from the Combined Loyalist Military Command. Another example of public policy changes is through restorative justice, a category of victim and offender encounter programs that can be regarded as a post-crime reconciliation program. John McCourt showed examples of the restitution, reconciliation and reintegration when he was part of the program to bring Catholic women across the river to Protestant communities where they had worked before the troubles. Through many of these community actions, peace has begun to grow throughout Northern Ireland, a specific example of community action is the work of Alternatives in Belfast. Alternatives is an organization who work with local para military groups to combat local violence in a peaceful way.16 These actions also aided in the political movements toward peace. The fork in the road that seemed to point in the direction of Irish unity was not the Dowing Street Declaration, but possibly the Frameworks for the Future published in February 1995. This document, drafted by Dublin diplomat Sean OhUiginn further shaped a ‘shared understanding between the British and Irish Governments to assist discussion and negotiations involving the Northern Ireland parties’.18 It also intended for new North/South institutions to be created leading to ‘agreed dynamic, new co-operative and constructive relationships’.19 This document gave Nationalist the hope of future Irish unity. It was strongly supported by the Nationalists and outright rejected by Unionists. The Declaration of Independence was a document adopted by Dáil Éireann, the revolutionary parliament of the self-proclaimed Irish Republic. It was signed at their first meeting in the Mansion House, Dublin, on January 21st, 1919. The Constitution of Ireland came into force on 29 December 1937. Controversial articles 2 and 3 were amended with the Good Friday Agreement. The Special Powers Act was a highly controversial sanction passed in 1922. For more information on the act see, the Internment page. 2. Signing of the Sunningdale, n.d.
9. 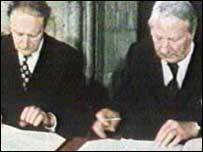 Signing of the Anglo-Irish, n.d.